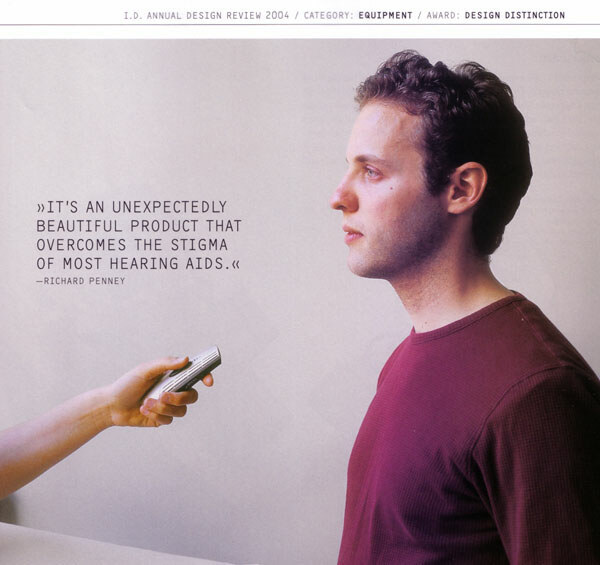 The brief was to develop a wireless directional microphone with a keenfocus on ergonomics and functionality, and on communicating sophistication inresponse to stigmatization. Oh, and it won an award! The handheld microphone picks up sounds from the direction in which it's pointed, filtering out other noise and wirelessly transmitting the words to any behind-the-ear hearing aid. The curved form fits comfortably in the palm, and a pullout stand lets the unit rest upright on a table. The instrument was designed to be anything but medicinal, and more like what eyeglasses have become - a fashionable prosthesis.